The award-winning Miller Nichols Chapter Presidents Leadership Academy (CPLA) provides an opportunity for all chapter and colony presidents to visit the Fraternity's founding site in Oxford, Ohio. What follows is three days of intense leadership training and networking with other undergraduate presidents. This program concentrates on personal and chapter leadership. Presidents learn to become more effective leaders, develop personal officer goals and design a framework for chapter success. The curriculum also includes reviewing Standard Chapter Operating Expectations and networking with top university professionals, General Fraternity volunteers and Administrative Office staff. 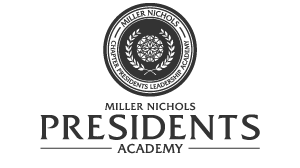 The Presidents Academy was named and endowed by the Miller Nichols Charitable Foundation in memory of Miller Nichols, Kansas '33. This program received the HRH Fellow for Educational Program Development Award from the Fraternity Executives Association (2005), the Most Outstanding Use of a Foundation Grant Award from the North-American Interfraternity Conference (2005) and the Excellence in Educational Programming Award from the Association of Fraternity Advisors (2006). Attendees do not need to make hotel reservations. Hotel accommodations are covered in the registration and are arranged by the Administrative Office staff. Registration opens October 1 and closes December 15.